Second Chorus is a 1940 musical comedy starring Fred Astaire, Paulette Goddard, Burgess Meredith and Artie Shaw. Danny O’Neill (Astaire) and Hank Taylor (Meredith) are two rival trumpeters with college band “O’Neill’s Perennials”. I’ll say this now: are Astaire and Meredith slightly unbelievable as college students? Of course, but then again they are given licence to be by the fact that their characters have been intentionally failing for seven years in order to stay eligible to perform in the band. They accidentally acquire themselves a manager, Ellen Miller (Goddard), who soon has them booked all over the place, beginning to encroach on the bookings which would otherwise have gone to Artie Shaw (playing himself) and his band. Tired of this, Artie manages to poach Ellen and she starts working for him. Things turn even more sour between she and the boys when they mess up an audition she gets for them with Artie due to their jealous rivalry. Naturally further hi jinx and comedic–almost farcical–moments abound, but I won’t spoil the outcome for you! I wasn’t initially expecting very much from Second Chorus. I would call myself quite an Astaire fan, but I admit that I wasn’t really aware of this film until I saw it scheduled on television one day recently and decided to take a look, always hungry to experience new (new to me!) movies. Well, I was pleasantly surprised. 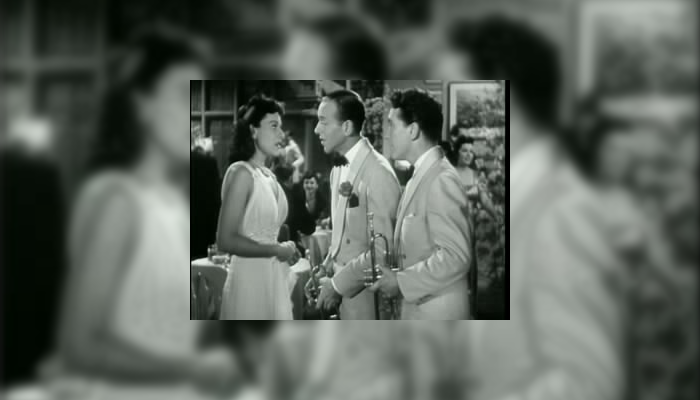 There are some rather good musical numbers, thanks not only to Astaire and his sublime dance in this case, but also Artie Shaw and his group. I would say if you’re coming primarily for Fred Astaire, there is a chance you may be disappointed, as his hit rate as compared with what you might call his classics is not as high as you might be expecting, and this is probably why I hadn’t been aware of this particular film. However, he works marvellously as a part of the strong cast, bouncing off Burgess Meredith effectively, with the required comic abrasiveness and reluctant camaraderie alternately. There is little more I can give to this film without spoiling the plot, other than to say that it stands up quite well as a film in its own right without having to be called a Fred Astaire Musical. Its pacing is good, it doesn’t feel self indulgent, and is rather typical of films of this type from this era, in that it just gets on with storytelling in a clever way without leaving anyone out. This film gives you light-hearted humour; good music and dance; a story robust enough to satisfy; and all executed in a rather rewarding way. When I dedicated some time to sitting down and watching Second Chorus, it didn’t drag, and I didn’t regret a moment of it. Overall a rather enjoyable 84 minutes! Second Chorus is available on various DVD and Blu-ray releases, and also via Amazon Prime video UK and US.